Two major prehistoric cultures lived here before the modern tribes that Jolliet & Marquette met. The Woodland Culture existed from 1000 BC to 1000 AD. It evolved into the Mississippian Culture which lasted from about 800 AD to 1600. European contact marked the end of this culture wherever various environmental and social stresses hadn’t already ended it. 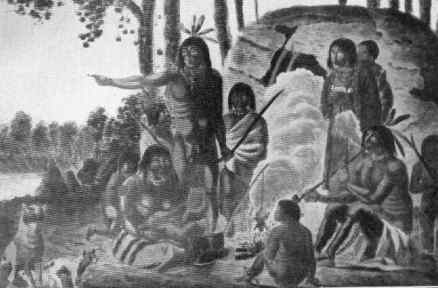 People who were living here at the time of Columbus lived in wigwams made of basswood saplings covered with sewn mats of cattails and reeds. They ate well: venison, turkey, duck, goose, smoked sturgeon, baked salmon with wild rice. Joliet and Marquette described the stew they were repeatedly feasted with called Sagamité. They steamed mussels. They had corn bread with maple sugar. For dessert they could choose from strawberry, raspberry, plum or blueberry compote. They knew the medicinal properties of many local plants; they would chew willow bark for relief of headache. The salicylic acid contained in the bark has since been synthesized as aspirin. They played games like field hockey and lacrosse. The men gambled extensively. They had warm comfortable clothes, wove intricate, strong baskets, and fashioned clay pots, knives, hammers, fish hooks, arrows, garden tools. They lived well by any standard. But not until the arrival of European explorers did they acquire post-stone age tools through gifts and the fur trade.